A New Beauty Subscription Service you’ll want in on! From the Lab is a cool monthly subscription service that works with top beauty research labs to get product delivered to your door 18 months before they’re available to the public! When you become a member you’ll receive a box with up to 3 full-size, high-end skin care, hair care and makeup products. If you love a product you can continue buying it through their online store. I got a sneak peak at the new Transforming Hair Cleanser No. 724. It’s way different than any shampoo I’ve ever tried before. In the shower, I poured a bit into my palm and was surprised at how oily it felt. I couldn’t imagine putting it into my hair–the thought of past olive oil hair treatments that left me with greasy locks that took numerous shampoos to get out filled me with fear!–but in the name of research for The Beauty Wall I did it. I massaged No. 724 into my scalp and through my strands. Then, I went to rinse my hands and amazingly my hands had no oily residue on them. I rinsed my hair and thought about adding my usual conditioner (I never go without!) but I wanted a true test so instead, I stepped out of the shower to towel dry. My comb through was easy with no tangles. 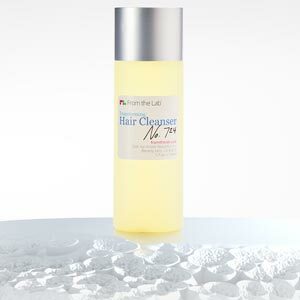 Instead of harsh sulfates that strip hair of nutrients and protectants Transforming Hair Cleanser No. 724 contains a blend of oils and stem cell technology plus andiroba oil, a new ingredient to the U.S., said to enhance thin, damaged hair by strengthening and promoting new hair growth, while curly and coarse hair is left weightless and tamed. After just one use I noticed how shiny and silky smooth my hair hair looked and felt. Once No. 724 gets into the hands of big beauty companies you can be sure it will retail for way more than the $29.95 starting price for a monthly subscription. I can’t wait to get in on this service! If their other products are half as good as 724 this is one beauty subscription service that’ll be worth every penny! Click here for more information or to join From the Lab.